I’m continuing on my quest to read more about world history this year, since I enjoyed India After Gandhi and A World At Arms so much last year. I bought a couple of books about American history – since I didn’t grow up here, I don’t know a lot of basic history that people learn about in school. I decided to start with Mayflower because the Pilgrims and their story are so embedded in the cultural consciousness of America, but I really don’t know much about what actually happened. Mayflower is well-written and well-researched, but it isn’t the definitive history of the Mayflower voyage that I was hoping it would be. The first third of the book talks about the Pilgrims and their preparations for the voyage, the voyage itself, and the first year of their life in the colonies. This was the most fascinating part of the book. It covers things like why the Pilgrims chose to settle at the site of Plymouth, how their first contact with the Native Americans went (not well), what they did to survive (steal corn, for example), what they planned and how their plans went awry, how they finally established good relationships with the Native Americans, and things like that. Unfortunately this level of detail stops right after the “First Thanksgiving”, and the book skips ahead about fifty years to the story of how Native-British relations soured and led to King Philip’s War. The rest of the book is a history of King Philip’s War, which was interesting as well since I didn’t know anything about that time period, but I find socio-political and economic histories much more interesting than histories of war, so I was a little let down. The author mentions that in the intervening time, New England was settled much more extensively and infrastructure developed (for example, a judicial system), but doesn’t go into any of the interesting details – how the governments were formed, how the settlers spread outside Plymoth, what kind of political relationships they had with the new settlers, how they managed to become self-sufficient and developed trade relationships – none of that is explored. Instead, Philbrick goes into a thorough history of the war – the various battles, the actions of the Native American leaders (with special attention paid to the infamous King Philip), and the troop movements of the British settlers. There are some interesting tidbits in there (I found the formation of Rhode Island interesting, for example), but the focus is definitely on war. I was a little bored by all the details. Philbrick compares the devastation of the war to the Civil War and World War II in terms of the percentage of population killed, but the fact remains that most of the battles involved a dozen to a hundred men. There were a few bigger battles, and it’s clear that the impact on the Native American population was significant, but with most of the sources available to reconstruct what happened being on the British side, it makes the telling very one-sided. 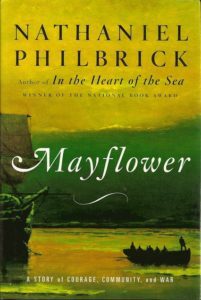 I think this is a book still worth reading, but I wish it had been called King Philip’s War instead of Mayflower – but the lack of name recognition means it probably wouldn’t have done so well.